Our knitted dress is proof that less is more. The versatile wide-neck shape has subtle '60s style with flared sleeves and contrast stripes. Enhance the retro vibe with knee-high boots or keep it simple with a pair of ballet flats. What's a little bit skater and a lot of fun? This knitted dress. Cosy enough for cool days, and lightweight enough for warmer ones, it has a comfortable waistband and playful ruffles at the neck and cuffs. A pointelle skirt with standout contrast stripes gives it a look-at-me finish. 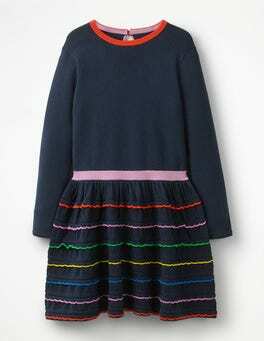 Red and yellow and pink and green... You can twirl a rainbow in this knitted dress, never mind sing one. A tiered scalloped skirt sits just above the knee, while the popping stripes on the ruffles complement the striped waistband and collar. Long sleeves mean it's cosy as well as colourful. Ready your wardrobe for this knitted A-line dress. It has a hint of alpaca for softness, while the contrast-colour cuffs on the flared sleeves and collar make an impact. Wear it loose and relaxed or add a belt to accentuate your curves. Crafted from a merino-cotton blend, the round neck and easy lines are elevated by a contrast-stripe belt that cinches in the waist. Blouson sleeves add a contemporary twist, showing that while it may be soft and simple to wear, it's also very stylish. Get your little one feeling as warm as the scarf-wrapped teddybear on our supersoft cotton-rich leggings. These seasonal essentials are finished with an elasticated waist and ribbed ankles to keep them in place, no matter how much wriggling and crawling baby gets up to. This knitted jumper splashes more than a little colour around. Lovingly crafted with a chunky rib, it has a mock turtleneck for extra warmth and a slightly cropped fit. Who knew staying warm could look this good? Forest friends don't have to be imaginary – owl and deer are here to play. 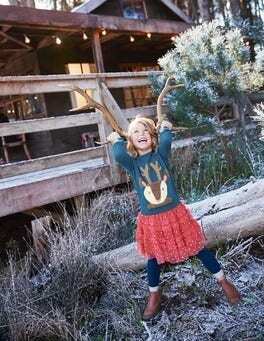 We've added a dash of merino wool to this cotton-rich jumper to make it extra snuggly for winter woodland explorers. These furry characters combine storybook charm with soft strokeability and pretty embroidery. Faced with cold chills get your paws on this set of hat and mittens. The kitten design delivers the adorable, while the supersoft fleece lining takes care of cosiness. A button fastening on the hat keeps it secure and toasty. 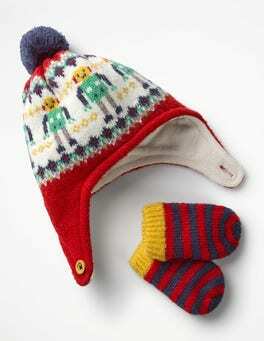 Make sure everyone has a brrr-illiant day with this cosy set, complete with robot print and pompom detailing. The classic mittens help keep fingers toasty in a cold snap, while the fleece-lined hat with secure fastening will warm tiny ears all day long. We take your standard knitted dress, and we raise you this fit-and-flare, pleated-skirt, contrast-stripe, midi-length, scoop-neck knitted dress. Yes, it really does have all of those things. And we haven't even talked about the subtle blouson sleeves. This is a statement dress, if ever we saw one. That elusive point where comfort meets style? This knitted dress. Crafted from a soft yarn, it's fitted at the waist before whooshing out into a full, pleated skirt falling just below the knee. But the best part? There are frills. We've added this feminine detail to the scoop neck and cuffs. 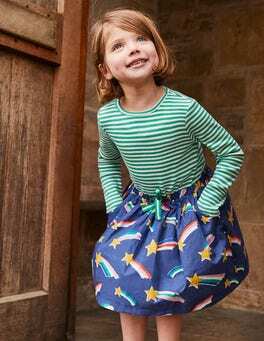 This hotchpotch dress combines the best of both worlds with a ribbed bodice and contrasting pattern skirt, all neatly gathered with a drawstring. Crafted from soft cotton, it also features two pockets – just the thing for stashing treasures. …has never been this elegant. With a full skirt, kimono-style sleeves and all-over floral print, this dress is ready to be seen – but the elasticated waist and laid-back drape are ripe for relaxation. Dress it down with trainers and stroll around with your hands in the pockets (yes, it has pockets). Is it just us, or do pockets make dresses better? This one's got an exposed zip and the two large patch pockets on the front, meaning your handbag will soon be out of a job. 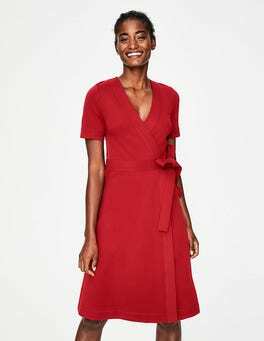 Crafted from a fine, supersoft cord fabric, this dress has a gently fitted shape thanks to the panelled cut and waist seam. 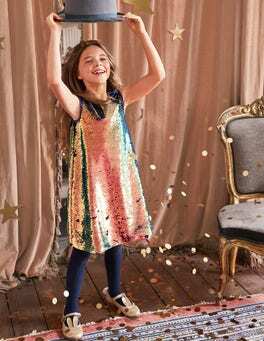 This ultra-comfortable sweatshirt dress is trimmed with actual rainbows on its cuffs and down its back. The brushed cotton is soft as a cloud and it's easy to slip on and head out to play. Found a pot of gold? Pop it in the patch pockets. Your latest capsule-collection essential has arrived. Made from drapey viscose crepe, this dress has a contrast waist tie and three-quarter sleeves for a flattering shape. Pair with flats 9-to-5 and heels 6-to-11. Now that's versatility. When that big invitation hits your inbox, reach for this show-stopping modern midi dress in softly draped georgette. The floaty fabric is easy to care for, while feminine ruffles, a waist-cinching tie and notch neck add the finishing touches. This sleeveless dress is made from a soft cotton fabric with a bit of stretch for flexibility. We've added flattering multi-stitch detailing and handy pockets, too. Wear it solo on warm days or over a Breton tee when there's a chill in the air. We know how to do a good print, and we're not shy about it. The bold paisley pattern of this midi-length dress is our latest triumph, with splashes of vibrant colour. If you can see past the stunning print, you'll be pleased to find we've added a cotton lining and ever-so-practical pockets too. Why have one ruffle when you can have four? This flouncy dress is playful and sophisticated, made from lightweight crinkle georgette with added frills at the cuffs. Slightly sheer blouson sleeves amp up the romance factor, making this the perfect partner for boots or heels (and cocktails). This dress is an expert at making an impression. Its pièce de résistance may be the blouson sleeves but it also has a subtle V-neck, buttoned cuffs, panelled pencil skirt and fitted bodice to balance them out. Swap your courts for killer heels and wear this piece to parties as well as work. By popular demand, this bestselling favourite is back – a beautifully flattering sleeveless dress with an above-the-knee cut and tailored pleats at the waist to create an hourglass silhouette. We've finished off the structured style with a roll-collar for a modern take on femininity. Red lipstick at the ready – this fit-and-flare dress is sure to bring out your inner Fifties screen siren. The skirt is full for that feminine swish, while a notch neck and cinched waist create a flattering shape. Just add cat-eye sunglasses for that take-me-to-the-Riviera finish. It’s the little things that get you noticed… like the intricate pintuck detailing and elegant blouson sleeves on this drapey dress. In fluid viscose that's cut to perfection, it'll make you look like you've made all the effort when it was (whisper it) oh-so easy. Easy elegance comes in the form of this bright dress. With contrasting feather prints, a gathered bodice and a full skirt, it'll give you an hourglass shape that shows you off in all the right places. Passport, sunglasses, lightweight linen dress... Now you know it's a holiday. This throw-on-and-go design features buttons on the shoulders with contrast stitching, and side split at the hem. Cinch the waist with the fabric belt or leave it loose to catch that sea breeze. It's all peace and love with our oh-so-'60s balloon-sleeved dress. The supersoft satin-backed crepe is in-house-designed floral patterns or solid black. Cut in a classic shift shape, with a stand collar, this piece can be teamed with boots or heels (beehive optional). You loved it so much, we had to bring it back. In a range of tempting new options (including flocking), the relaxed shape is comfortable in supersoft loop-back cotton and easy to wear – simply throw it on with pumps or trainers and go. Swing into action in this Sixties-inspired dress. Featuring a high-impact print and a fitted bodice for a flattering shape, it's an easy afternoon-to-after-dark option. Leave the notch neck closed or wear it open for a relaxed twist. Last year you LOVED our Riviera dress, so we've brought it back with a longer skirt, so it's better than ever. With a flattering waist-tie belt and fit-and-flare shape, this elegant piece ticks all the right boxes. We’ve got effortless elegance wrapped up with this cotton-linen dress. An adjustable belt lets you customise the fit of the flattering wraparound design so you can tie it front or back, while the lightweight floaty fabric will keep you cool when the temperature rises. A fluted hem gives this jersey dress a little twist. The triangle neck detail, classic three-quarter-length sleeves and drapey fabric put a feminine spin on this relaxed, easy-to-wear dress. Simply add silver accessories and you’re ready to sparkle. These days, power dressing is all about beautiful tailoring and standout details. We've cut this pencil dress from textured cotton, added an elegant roll collar and flattering princess seams – and yes, it's even got pockets. This 100% cotton dress has a trick up its sleeve. No, really – we made the care labels removable so it’s fully reversible. The outside is in spots or stripes with a different print inside, so every occasion’s covered. Life’s just more fun inside out, isn't it? Stripes or prints... How about stripes AND prints? 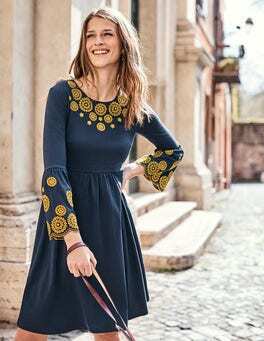 This hotchpotch dress combines the best of both worlds with a ribbed bodice and contrasting pattern skirt, all neatly gathered with a drawstring. Crafted from soft cotton, it also features two pockets – just the thing for stashing treasures. A dress for playing on the climbing frame? That's right. This drop-waisted sweatshirt dress is as light as a feather. The fabric is brushed on the inside for maximum softness and there are handy pockets too. 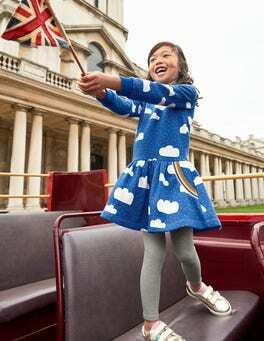 Choose from sparkly stripes or clouds and rainbows and race to the nearest park. Whatever your day has in store, this dress will deliver. It has a tiered skirt for extra fullness and an in-house-designed print. Cut from a relaxed, drapey fabric, it features a classic crew neck and wide sleeves. It's our favourite kind of dress: elegant, yet laid-back. Can you really call it a wardrobe if it doesn't contain a trusty denim dress? We don't think so. In a classic shift dress shape, we added subtle slide slits for a modern twist. 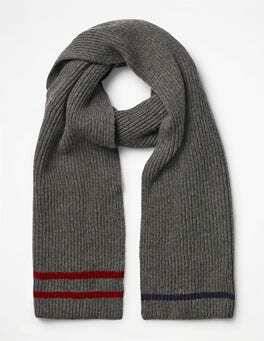 It has an exposed zip with a grosgrain pull because we love those special finishing touches. …about creases – this jersey tiered dress is the definition of ready-to-wear. The fixed wrap bodice and cinched waist create a fitted shape, while the floaty tiered skirt adds volume to your silhouette. A smart V-neck and sleeveless design make this dress the perfect partner for statement jewellery. Good news for pompom addicts: we've taken everyone's favourite T-shirt dress and trimmed the neck and sleeves with bouncy little spheres of loveliness. The easy shape makes this the perfect grab-and-go outfit. Looking for the midi dress of your dreams? This is it. Its blouson sleeves are elegant and the lightweight crepe has a draped finish to highlight your figure. Simply cinch your waist with the fabric tie and add heels. This midi dress takes statement stripes in a new direction. Crafted from drapey fabric with ruching on the waist and shoulders, it's the ultimate meeting point of comfort and style. The supercharged ponte fabric of this midi dress provides the three smart-occasion essentials: softness, stretch and structure. The floral patterns, cinched waist and side-dip hem are worth raising a glass to. …blend of the two. We've decorated this sleeveless dress with bold patterns to bring a touch of magic to your day, while the drapey cotton blend keeps you cool whether you're at work or off duty. Handy pockets and subtle gathers at the waist and shoulders make this soft dress an all-round winner. This dress knows everything you need to know about flattery. Strategically placed print? Check. Fixed-wrap neckline? You got it. Fluted sleeves? Oh, yes. For extra style points, we also added a fabric belt that you can tie front, side or back – whatever suits you. Work the (night) shift dress in luxurious silk-blend velvet with stylish micro ruffles at the neck and cuffs. With a relaxed fit that sits just above the knee, subtle, elegant gathers at the neckline and flattering half sleeves, it’ll fast become a party wardrobe mainstay. This ultra-flattering dress will bring a spot of sunshine to your life. Its soft and stretchy fabric hugs you in all the right places, while the mock-wrap shape cinches in your waist. And that's not all – its flippy skirt is perfect for hitting the dance floor. If you’re after minimum effort and maximum impact, a jersey dress is your faithful friend. For a twist, we’ve added bell sleeves and a shape-enhancing wrap front to this drapey, stretchy number. The result? The most flattering style of the season. It’s no secret that we love a statement print, we’re so enamoured with this one we used it twice. Our hotchpotch midi dress has a wrap-over front that cinches the waist and gives a flattering v-neck. The floaty fabric and asymmetric hemline give it a feminine drape.